There’s a deer turning heads in Calgary, his name is Bucky and he’s become a bit of a celebrity among animal-watchers. There's a deer turning heads in Calgary, his name is Bucky and he's become a bit of a celebrity among animal watchers. You know when you see him, because as the city's urban conservation lead Chris Manderson says, he's a pretty buff buck — and he's always striking a regal pose. 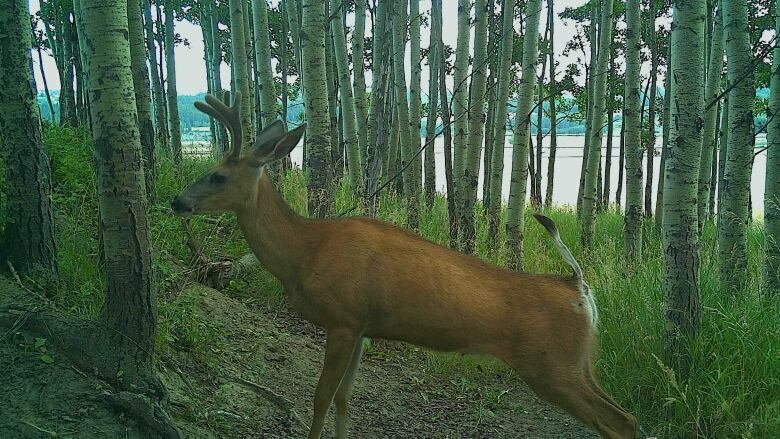 The fan-favourite deer first emerged as part of a city initiative called Calgary Captured, a citizen-science program that launched in February. It asked citizens to identify wildlife from photos taken by remote cameras in 13 parks across the municipality. Users online quickly named the handsome animal and have kept their eyes peeled for him ever since. In June, the city released its second collection of images for the public to categorize — and Manderson says Bucky could be in the newest batch. "He's posing in these really interesting ways," said Manderson. "He's sort of doing a show dog pose and things like that. There's been some speculation Bucky has a special friend as well — he's keeping other deer away except for this one friend and there's a bit of speculation about what that might mean." Naturalist and BiodiverCity Advisory Committee chair John McFaul says young bucks tend to buddy up but eventually become competitive when the colder months hit and they're trying to find a mate. He's encouraged to see citizens sharing the tale of Bucky and friends online and thinks its a great way to keep citizen scientists engaged with the city's program. "It shows people are really keen on trying to understand what the wildlife is doing within our natural areas," said McFaul. "By identifying specific animals, you can sort of follow them in some ways ... and get an appreciation on their use of the habitat and the natural areas." He says by naming some of the critters, users are more likely to go back and see how a character like Bucky the deer is doing. Manderson says it's possible Bucky actually sleeps under the camera that's been placed in one of Calgary's parks, so when he gets up and moves the camera captures his perfect stretch pose. Bucky isn't the only deer online users are fawning over. There's also "Mr. Magnificent," a mule deer with some impressive-looking horns. Manderson says the fact that citizens are taking to the net to name their favourite on-camera animal personalities shows they have ownership of the program — and that's what he wants to see. "One of the things we talk about in our business of parks is people losing their connection to the landscape in a digital world," said Manderson. "This is kind of an interesting way to provide a bit of that connection, too." 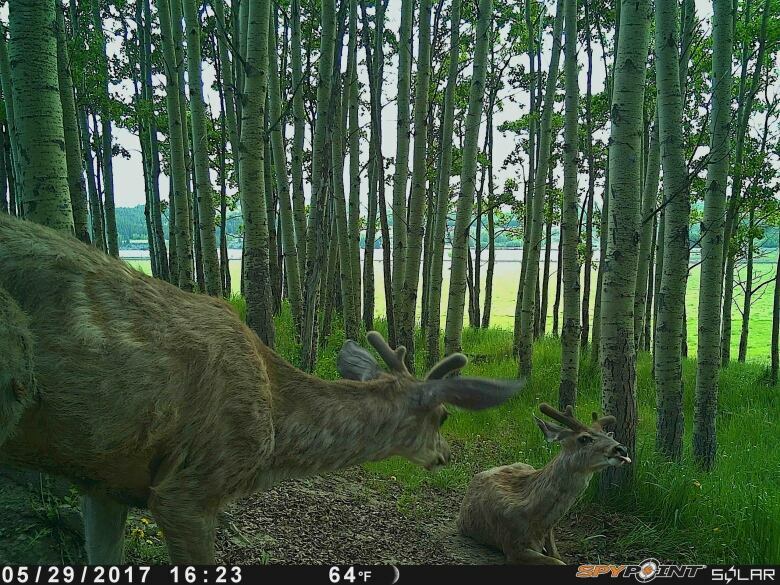 The City of Calgary has been gathering photos of wildlife in city parks as well as Fish Creek Provincial Park since May 2017. 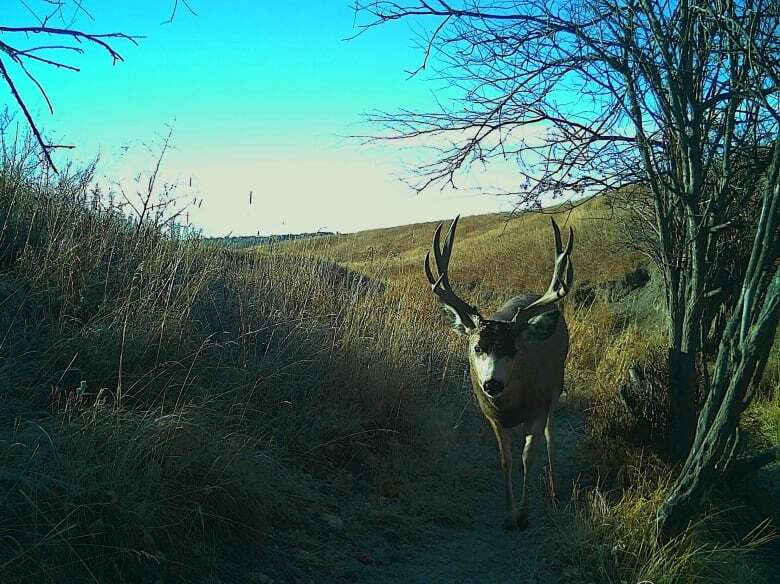 The Calgary Captured program launched in February 2018 and uses the citizen science portal known as Zooniverse to give citizens a window into what kind of critters roam local parks. Participants who click through and categorize an image are actually helping the parks department collect data it hopes will provide insight regarding how animals behave and move within the city limits. The city's preliminary findings from its second batch of photos include images of a cougar and a black bear — which is the first time they've captured pictures of those animals. Manderson says the city was able to identify 600,000 wildlife pictures in 51 days as part of "Season 1," which included pictures gathered between May 17 and Sept. 17 of this year. He says the city hopes to do three releases of photos for the online portal every year.